This special Etching titled EVOLUTION (2013) is a specially crafted etching by Dr John Olsen, (A.O., O.B.E), in association with COFA, College of Fine Arts, UNSW. This fine art etching print was made with master printmaker Michael Kempson, which encapsulates the players who are intimately involved in the making, creating and selling of drawing, painting, and printmaking. 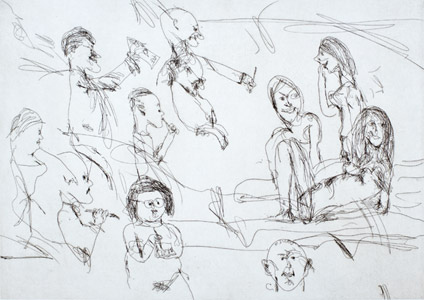 John Olsen, through his generosity has produced this limited edition fine art etching titled ‘Life Class (Evolution)’ to be available for only $1200 that would normally retail for $3,800 in celebration of the new COFA (College of Fine Arts), University of New South Wales.